The Refined Geek » They Bleed Pixels: Frustration Doesn’t Begin To Describe It. They Bleed Pixels: Frustration Doesn’t Begin To Describe It. Striking the right balance between making a game enjoyable and it’s relative difficulty level can be a rather tricky task. Way back in the dawn of gaming developers would often shoot for the high difficulty level simply because that meant people would play their game longer, even if that came at the cost of some enjoyability. It worked, for the most part, because I can remember becoming infuriated with many games yet still being unable to put them down, losing many hours to challenges that had long lost all meaning to me and all that remained was a desire to see it finished. 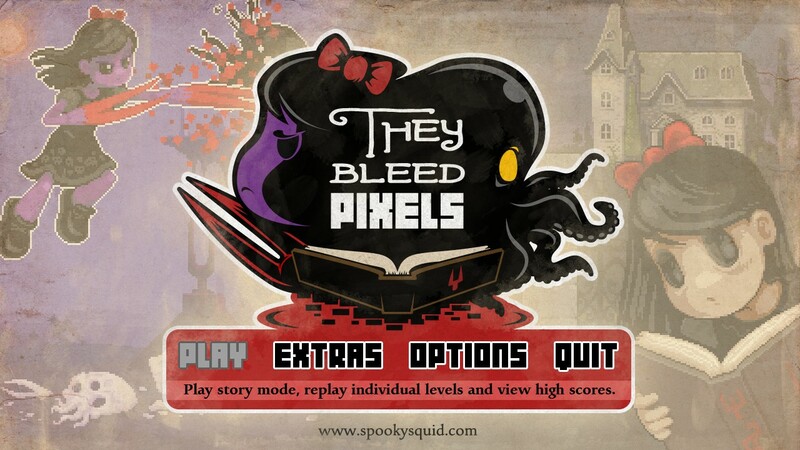 They Bleed Pixels, the latest game from Spooky Squid Games Inc, feels like a homage to those days and if my reaction to it was anything to go by it’s a pretty authentic experience. 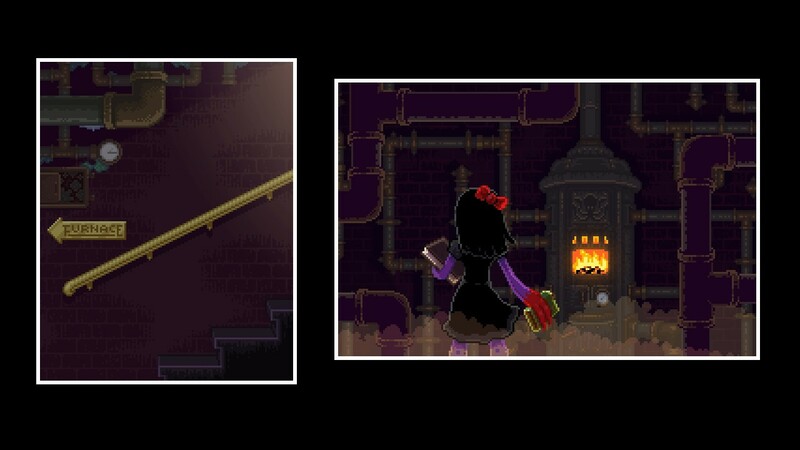 They Bleed Pixels puts you in a Lovecraftian world where you’re put in control of an anonymous (I couldn’t find out her name, at least) girl who’s dropped off at a home for troubled girls. It’s at this place she discovers a book, dripping in blood and pulsating with a decidedly evil red glow, that invades her dreams and twists her physical form into a purple skinned version of herself with claws for hands. She then has to battle her way past countless enemies and obstacles in order to reach the end and wake up from the terrible dream that is holding her captive. As my long time readers will know I’ve got a bit of a thing for pixel art games, probably due to the nostalgia factor, and They Bleed Pixels delivers quite well in this regard. The art direction is great as everything has this eerie vibe to it, even when the music playing behind it is quite upbeat. This is only made better by the very satisfying explosions of pixels when you dispatch enemies (or yourself if you find the wrong edge of a saw) which fly across the screen and coat every surface they touch. Combined with the meaty foley that accompanies it They Bleed Pixels is quite a visceral experience for the eyes, ears and mind. The core game of They Bleed Pixels is the tried and true platformer which seems to take quite a lot of inspiration from the Super Meat Boy style of games. The mechanics are quite similar: you can grab onto walls and slide down them at varying paces, you have a double jump so that areas that seem inaccessible actually are and as you progress nearly every wall has something on it that will kill you. Like all games in its genre the platforming sections start off simple and then ramp up the difficulty slowly which I believe is the key to cementing you in your seat as you die repeatedly to the same obstacle. Unlike other platformer only titles They Bleed Pixels includes a combat system that makes use of only a single button for attack that can then be modified by the use of the movement and jump keys. For a game that obviously prefers a controller based scheme (most of the menus reference button A, for instance) I can see this working quite well, indeed Super Meat Boy’s developers recommend this as the conrol scheme of choice, but I ignored their advice and used my keyboard. Using these techniques, which are laid out for you in a tutorial, you can rack up big combos on your enemies which leads into one of the other game mechanics. Unlike other platformers which have set check points or only save at the end of the level They Bleed Pixels has a meter at the top of the screen which fills up when you dispatch your enemies. The higher your combos the faster it will fill so the game encourages you to blast through as fast as you can in order to fill your meter faster. Once its filled you can then stand still to create a checkpoint however you can also risk it and keep going in order to push your score even higher. It’s a dangerous mechanism and more than once I found myself sent back much father than I would of liked just because I wanted to amp my score up. For probably the first 2 dreams I was really enjoying the play style of They Bleed Pixels mostly because it felt like Super Meat Boy without the tendency to induce RSI. 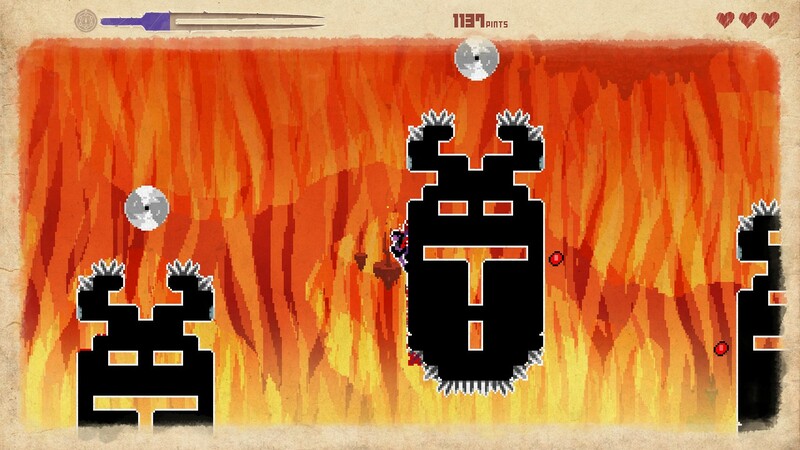 Sure there were a lot of tense moments but I never finished a level without more than a few dozen deaths, something which in Super Meat Boy just counted as the warm up. However as the game went on I found myself stuck on levels for up to an hour or more, throwing myself repeatedly at the same obstacles and seeming to get no where. Whilst I’d like to blame game bugs for it (and did for most of the time) after carefully watching what was happening I could only blame myself for what was happening, but that didn’t stop me from feeling frustrated. I think primarily my gripe with the later levels comes from the repetition of challenges that the player has already beatn previously. If you look at the screenshot below and compare it to the second one in this post you’ll note how similar these challenges are (jumping from one side of a block to the other) and that particular challenge is present in nearly every level. There are also long sections where you’re basically doing the same thing over and over until you get to the end which doesn’t feel like a good challenge. Indeed it feels more like a punishment for not being able to execute the moves correctly which can happen quite easily when you panic and hit the attack button rather than jump. Now don’t get me wrong, the game stands well enough on its own, but there was definitely a point where it transitioned from being a fun level of challenge to being just straight up insane and that’s where the fun started to rapidly drain out of it. 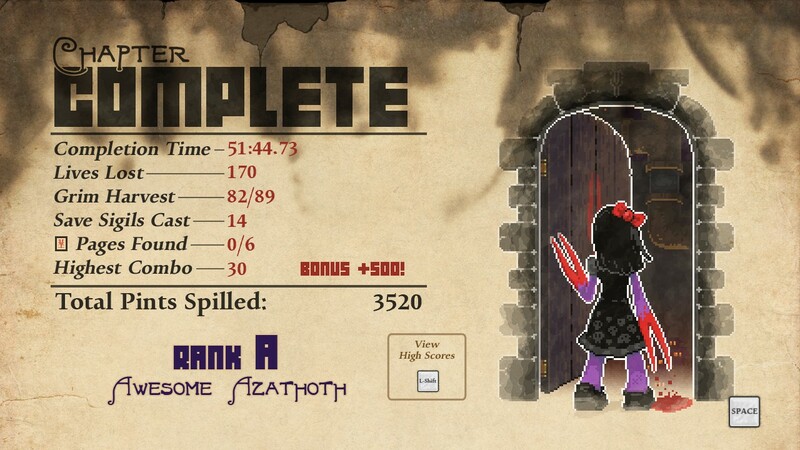 I got to the last level, heck I was only about 3 screens away from finishing the game, but after spending a good 20 minutes or so on a puzzle and seemingly getting no where I just couldn’t bring myself to go back to it. I will take the criticism that I just wasn’t good enough to complete it (my performance in Super Meat Boy is a testament to how mediocre I am with these kinds of games) but even that knowledge won’t change the fact that I stopped having fun in the last couple hours. For its genre They Bleed Pixels is an incredibly well polished title that will provide hours of frustrating enjoyment. Whilst I’m not into that whole achievement scene there are enough challenges listed to keep even the most dedicated achievement hunter mashing buttons for double, maybe even triple my play time. Whilst I might have lost interest in it right towards the end I can’t deny the overall quality of They Bleed Pixels, especially when compared to others in its genre. They Bleed Pixels is available right now on PC and Xbox360 for $9.99 and an equivalent amount of Xbox points. Game was played entirely on the PC with around 7 hours played and 19% of the achievements unlocked. Pingback: The Refined Geek » 140: Short, Sweet, Insane.